His parents were Tescelin, lord of Fontaines, and Aleth of Montbard, both belonging to the highest nobility of Burgundy. Bernard, the third of a family of seven children, six of whom were sons, was educated with particular care, because, while yet unborn, a devout man had foretold his great destiny. At the age of nine years, Bernard was sent to a much renowned school at Chatillon-sur-Seine, kept by the secular canons of Saint-Vorles. He had a great taste for literature and devoted himself for some time to poetry. His success in his studies won the admiration of his masters, and his growth in virtue was no less marked. Bernard’s great desire was to excel in literature in order to take up the study of Sacred Scripture, which later on became, as it were, his own tongue. “Piety was his all,” says Bossuet. He had a special devotion to the Blessed Virgin, and there is no one who speaks more sublimely of the Queen of Heaven. Bernard was scarcely nineteen years of age when his mother died. During his youth, he did not escape trying temptations, but his virtue triumphed over them, in many instances in a heroic manner, and from this time he thought of retiring from the world and living a life of solitude and prayer. 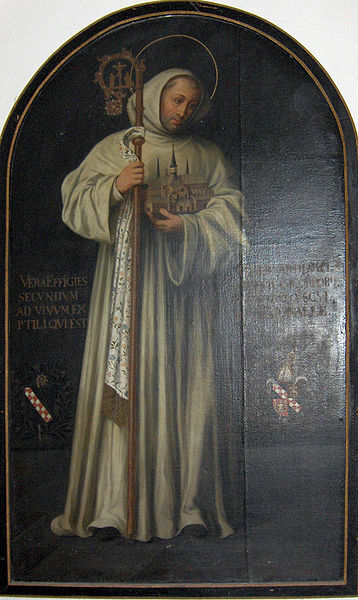 St. Robert, Abbot of Molesmes, had founded, in 1098, the monastery of Cîteaux, about four leagues from Dijon, with the purpose of restoring the Rule of St. Benedict in all its rigour. Returning to Molesmes, he left the government of the new abbey to St. Alberic, who died in the year 1109. St. Stephen had just succeeded him (1113) as third Abbot of Cîteaux, when Bernard with thirty young noblemen of Burgundy, sought admission into the order. Three years later, St. Stephen sent the young Bernard, at the head of a band of monks, the third to leave Cîteaux, to found a new house at Vallée d’Absinthe, or Valley of Bitterness, in the Diocese of Langres. This Bernard named Claire Vallée, of Clairvaux, on the 25th of June, 1115, and the names of Bernard and Clairvaux thence became inseparable. During the absence of the Bishop of Langres, Bernard was blessed as abbot by William of Champeaux, Bishop of Châlons-sur-Marne, who saw in him the predestined man, servum Dei. From that moment a strong friendship sprang up between the abbot and the bishop, who was professor of theology at Notre Dame of Paris, and the founder of the cloister of St. Victor. 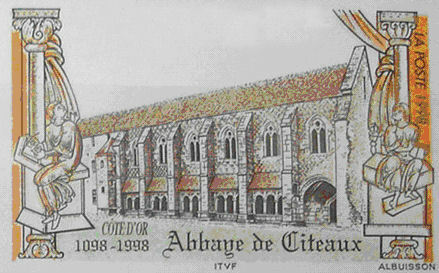 Cîteaux Abbey, founded by St. Robert, Abbot of Molesmes. The beginnings of Clairvaux were trying and painful. The regime was so austere that Bernard’s health was impaired by it, and only the influence of his friend William of Champeaux, and the authority of the General Chapter could make him mitigate his austerities. The monastery, however, made rapid progress. Disciples flocked to it in great numbers, desirous of putting themselves under the direction of Bernard. His father, the aged Tescelin, and all his brothers entered Clairvaux as religious, leaving only Humbeline, his sister, in the world and she, with the consent of her husband, soon took the veil in the Benedictine Convent of Jully. Clairvaux becoming too small for the religious who crowded there, it was necessary to send out bands to found new houses. n 1118, the Monastery of the Three Fountains was founded in the Diocese of Châlons; in 1119, that of Fontenay in the Diocese of Auton (now Dijon) and in 1121, that of Foigny, near Vervins, in the Diocese of Laon (now Soissons), Notwithstanding this prosperity, the Abbot of Clairvaux had his trials. During an absence from Clairvaux, the Grand Prior of Cluny, Bernard of Uxells, sent by the Prince of Priors, to use the expression of Bernard, went to Clairvaux and enticed away the abbot’s cousin, Robert of Châtillon. This was the occasion of the longest, and most touching of Bernard’s letters. In the year 1119, Bernard was present at the first general chapter of the order convoked by Stephen of Cîteaux. Though not yet thirty years old, Bernard was listened to with the greatest attention and respect, especially when he developed his thoughts upon the revival of the primitive spirit of regularity and fervour in all the monastic orders. It was this general chapter that gave definitive form to the constitutions of the order and the regulations of the “Charter of Charity” which Pope Callixtus II confirmed 23 December, 1119. In 1120 Bernard composed his first work “De Gradibus Superbiae et Humilitatis” and his homilies which he entitles “De Laudibus Mariae”. The monks of Cluny had not seen, with satisfaction, those of Cîteaux take the first place among the religious orders for regularity and fervour. For this reason there was a temptation on the part of the “Black Monks” to make it appear that the rules of the new order were impracticable. At the solicitation of William of St. Thierry, Bernard defended himself by publishing his “Apology” which is divided into two parts. In the first part he proves himself innocent of the invectives against Cluny, which had been attributed to him, and in the second he gives his reasons for his attack upon averred abuses. He protests his profound esteem for the Benedictines of Cluny whom he declares he loves equally as well as the other religious orders. 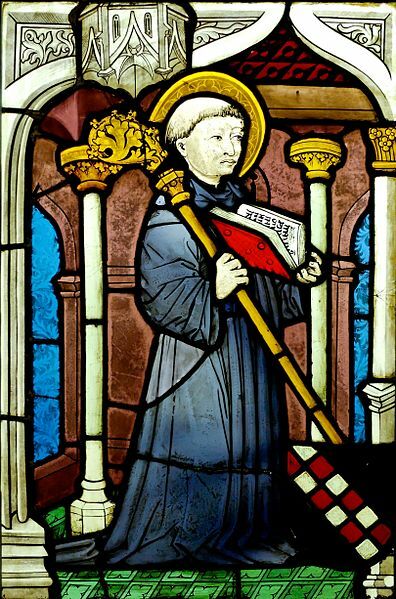 Peter the Venerable, Abbot of Cluny, answered the Abbot of Clairvaux without wounding charity in the least, and assured him of his great admiration and sincere friendship. In the meantime Cluny established a reform, and Suger himself, the minister of Louis le Gros, and Abbot of St. Denis, was converted by the apology of Bernard. He hastened to terminate his worldly life and restore discipline in his monastery. The zeal of Bernard did not stop here; it extended to the bishops, the clergy, and the faithful, and remarkable conversions of persons engaged in worldly pursuits were among the fruits of his labours. Bernard’s letter to the Archbishop of Sens is a real treatise “De Officiis Episcoporum”. About the same time he wrote his work on “Grace and Free Will”. 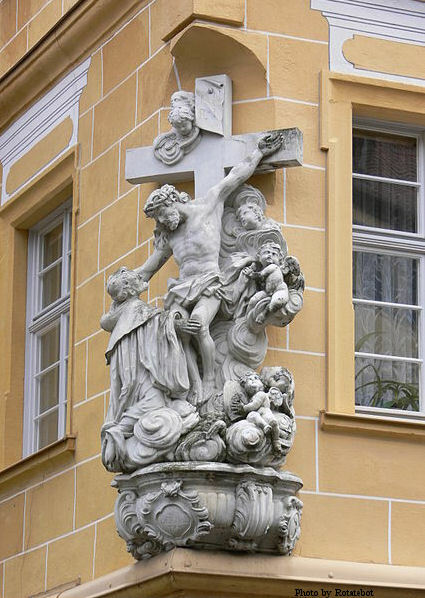 Statue of St. Bernard on a corner building in Bamberg, Germany. In the year 1128, Bernard assisted at the Council of Troyes, which had been convoked by Pope Honorius II, and was presided over by Cardinal Matthew, Bishop of Albano. The purpose of this council was to settle certain disputes of the bishops of Paris, and regulate other matters of the Church of France. The bishops made Bernard secretary of the council, and charged him with drawing up the synodal statutes. After the council, the Bishop of Verdun was deposed. There then arose against Bernard unjust reproaches and he was denounced even in Rome, as a monk who meddled with matters that did not concern him. Cardinal Harmeric, on behalf of the pope, wrote Bernard a sharp letter of remonstrance. “It is not fitting” he said “that noisy and troublesome frogs should come out of their marshes to trouble the Holy See and the cardinals”. Bernard answered the letter by saying that, if he had assisted at the council, it was because he had been dragged to it, as it were, by force. “Now illustrious Harmeric”, he added, “if you so wished, who would have been more capable of freeing me from the necessity of assisting at the council than yourself? Forbid those noisy troublesome frogs to come out of their holes, to leave their marshes . . . Then your friend will no longer be exposed to the accusations of pride and presumption”. This letter made a great impression upon the cardinal, and justified its author both in his eyes and before the Holy See. It was at this council that Bernard traced the outlines of the Rule of the Knights Templars who soon became the ideal of the French nobility. Bernard praises it in his “De Laudibus Novae Militiae”. In 1132, Bernard accompanied Innocent II into Italy, and at Cluny the pope abolished the dues which Clairvaux used to pay to this celebrated abbey—an action which gave rise to a quarrel between the “White Monks” and the “Black Monks” which lasted twenty years. In the month of May, the pope supported by the army of Lothaire, entered Rome, but Lothaire, feeling himself too weak to resist the partisans of Anacletus, retired beyond the Alps, and Innocent sought refuge in Pisa in September, 1133. In the meantime the abbot had returned to France in June, and was continuing the work of peacemaking which he had commenced in 1130. Towards the end of 1134, he made a second journey into Aquitaine, where William X had relapsed into schism. This would have died out of itself if William could have been detached from the cause of Gerard, who had usurped the See of Bordeaux and retained that of Angoulême. Bernard invited William to the Mass which he celebrated in the Church of La Couldre. At the moment of the Communion, placing the Sacred Host upon the paten, he went to the door of the church where William was, and pointing to the Host, he adjured the Duke not to despise God as he did His servants. William yielded and the schism ended. Bernard went again to Italy, where Roger of Sicily was endeavouring to withdraw the Pisans from their allegiance to Innocent. 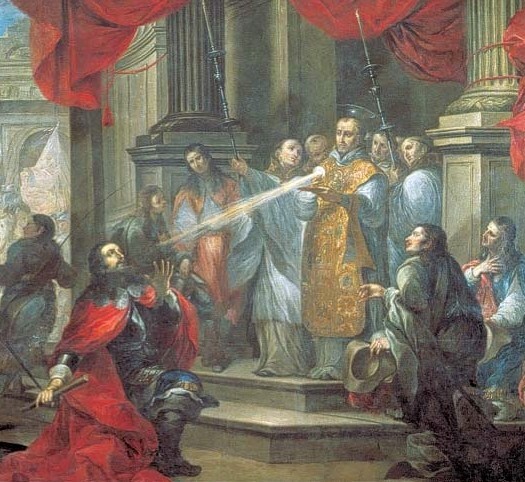 He recalled the city of Milan, which had been deceived and misled by the ambitious prelate Anselm, Archbishop of Milan, to obedience to the pose, refused the Archbishopric of Milan, and returned finally to Clairvaux. Believing himself at last secure in his cloister Bernard devoted himself with renewed vigour to the composition of those pious and learned works which have won for him the title of “Doctor of the Church”. He wrote at this time his sermons on the “Canticle of Canticles”. In 1137 he was again forced to leave his solitude by order of the pope to put an end to the quarrel between Lothaire and Roger of Sicily. At the conference held at Palermo, Bernard succeeded in convincing Roger of the rights of Innocent II and in silencing Peter of Pisa who sustained Anacletus. The latter died of grief and disappointment in 1138, and with him the schism. Returning to Clairvaux, Bernard occupied himself in sending bands of monks from his too-crowded monastery into Germany, Sweden, England, Ireland, Portugal, Switzerland, and Italy. Some of these, at the command of Innocent II, took possession of Three Fountains Abbey, near the Salvian Waters in Rome, from which Pope Eugenius III was chosen. Bernard resumed his commentary on the “Canticle of Canticles”, assisted in 1139, at the Second General Lateran Council and the Tenth Oecumenical, in which the surviving adherents of the schism were definitively condemned. About the same time, Bernard was visited at Clairvaux by St. Malachi, metropolitan of the Church in Ireland, and a very close friendship was formed between them. St. Malachi would gladly have taken the Cistercian habit, but the sovereign pontiff would not give his permission. He died, however, at Clairvaux in 1148. In the year 1140, we find Bernard engaged in other matters which disturbed the peace of the Church. Towards the close of the eleventh century, the schools of philosophy and theology, dominated by the passion for discussion and a spirit of independence which had introduced itself into political and religious questions, became a veritable public arena, with no other motive than that of ambition. This exaltation of human reason and rationalism found an ardent and powerful adherent in Abelard, the most eloquent and learned man of the age after Bernard. “The history of the calamities and the refutation of his doctrine by St. Bernard”, says Ratisbonne, “form the greatest episode of the twelfth century”. Abelard’s treatise on the Trinity had been condemned in 1121, and he himself had thrown his book into the fire. But in 1139 he advocated new errors. Bernard, informed of this by William of St. Thierry, wrote to Abelard who answered in an insulting manner. Bernard then denounced him to the pope who caused a general council to be held at Sens. Abelard asked for a public discussion with Bernard; the latter showed his opponent’s errors with such clearness and force of logic that he was unable to make any reply, and was obliged, after being condemned, to retire. he pope confirmed the judgment of the council, Abelard submitted without resistance, and retired to Cluny to live under Peter the Venerable, where he died two years later. 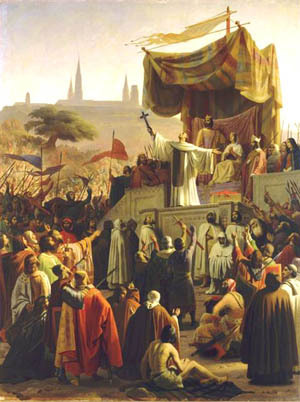 St. Bernard preaching the Second Crusade painted by Émile Signol. Innocent II died in 1143. His two successors, Celestin II and Lucius, reigned only a short time, and then Bernard saw one of his disciples, Bernard of Pisa, Abbott of Three Fountains, and known thereafter as Eugenius III, raised to the Chair of St. Peter. Bernard sent him, at his own request, various instructions which compose the “Book of Consideration“, the predominating idea of which is that the reformation of the Church ought to commence with the sanctity of the head. Temporal matters are merely accessories; the principal are piety, meditation, or consideration, which ought to precede action. The book contains a most beautiful page on the papacy, and has always been greatly esteemed by the sovereign pontiffs, many of whom used it for their ordinary reading. Alarming news came at this time from the East. Edessa had fallen into the hands of the Turks, and Jerusalem and Antioch were threatened with similar disaster. 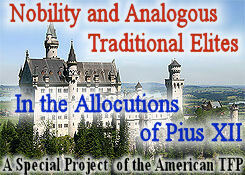 Deputations of the bishops of Armenia solicited aid from the pope, and the King of France also sent ambassadors. The pope commissioned Bernard to preach a new Crusade and granted the same indulgences for it which Urban II had accorded to the first. A parliament was convoked at Vezelay in Burgundy in 1134, and Bernard preached before the assembly. The King, Louis le Jeune, Queen Eleanor, and the princes and lords present prostrated themselves at the feet of the Abbot of Clairvaux to receive the cross. The saint was obliged to use portions of his habit to make crosses to satisfy the zeal and ardour of the multitude who wished to take part in the Crusade. Bernard passed into Germany, and the miracles which multiplied almost at his every step undoubtedly contributed to the success of his mission. The Emperor Conrad and his nephew Frederick Barbarossa, received the pilgrims’ cross from the hand of Bernard, and Pope Eugenius, to encourage the enterprise, came in person to France. It was on the occasion of this visit, 1147, that a council was held at Paris, at which the errors of Gilbert de la Porée, Bishop of Poitiers, were examined. He advanced among other absurdities that the essence and the attributes of God are not God, that the properties of the Persons of the Trinity are not the persons themselves in fine that the Divine Nature did not become incarnate. The discussion was warm on both sides. The decision was left for the council which was held at Reims the following year (1148), and in which Eon de l’Etoile was one of the judges. Bernard was chosen by the council to draw up a profession of faith directly opposed to that of Gilbert, who concluding by stating to the Fathers: “If you believe and assert differently than I have done I am willing to believe and speak as you do”. The consequence of this declaration was that the pope condemned the assertions of Gilbert without denouncing him personally. After the council the pope paid a visit to Clairvaux, where he held a general chapter of the order and was able to realize the prosperity of which Bernard was the soul. The last years of Bernard’s life were saddened by the failure of the Crusade he had preached, the entire responsibility for which was thrown upon him. He had accredited the enterprise by miracles, but he had not guaranteed its success against the misconduct and perfidy of those who participated in it. Lack of discipline and the over-confidence of the German troops, the intrigues of the Prince of Antioch and Queen Eleanor, and finally the avarice and evident treason of the Christian nobles of Syria, who prevented the capture of Damascus, appear to have been the cause of disaster. Bernard considered it his duty to send an apology to the pope and it is inserted in the second part of his “Book of Consideration“. There he explains how, with the crusaders as with the Hebrew people, in whose favour the Lord had multiplies his prodigies, their sins were the cause of their misfortune and miseries. The death of his contemporaries served as a warning to Bernard of his own approaching end The first to die was Suger (1152), of whom the Abbot wrote to Eugenius III: “If there is any precious vase adorning the palace of the King of Kings it is the soul of the venerable Suger”. Thibaud, Count of Champagne, Conrad, Emperor of Germany, and his son Henry died the same year. From the beginning of the year 1153 Bernard felt his death approaching. The passing of Pope Eugenius had struck the fatal blow by taking from him one whom he considered his greatest friend and consoler. Bernard died in the sixty-third year of his age, after forty years spent in the cloister. He founded one hundred and sixty-three monasteries in different parts of Europe; at his death they numbered three hundred and forty-three. 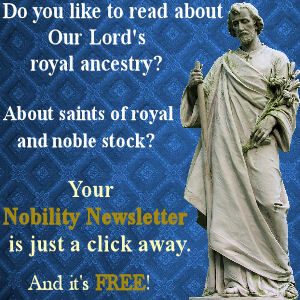 He was the first Cistercian monk placed on the calendar of saints and was canonized by Alexander III, 18 January 1174. Pope Pius VIII bestowed on him the title of Doctor of the Church. The Cistercians honour him as only the founders of orders are honoured, because of the wonderful and widespread activity which he gave to the Order of Cîteaux. “On the Canticle of Canticles“. St. Bernard explained in eighty-six sermons only the first two chapters of the Canticle of Canticles and the first verse of the third chapter. Many other letters, treatises, etc., falsely attributed to him are found among his works, such as the “l’Echelle du Cloître”, which is the work of Guigues, Prior of La Grande Chartreuse, les Méditations, l’Edification de la Maison intérieure, etc.